The Backroom | Author and Illustrator Javaka Steptoe @ DPL on April 12th! Author, illustrator, and artist Javaka Steptoe will be speaking at the Main Branch of the Detroit Public Library (Friends Auditorium- A Level) on Tues. April 12th from 10am to 11 am, and signing books from 11:30 am to 12:30 pm as part of National Library Week. 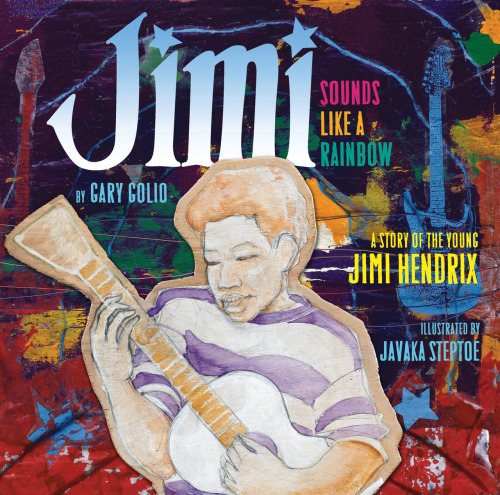 Javaka is the author of the recent Coretta Scott King Honor-winning title, Jimi Sounds Like a Rainbow: A Story of the Young Jimi Hendrix, among many other titles. This event is free and open to the public. Book Beat will be selling books for the author at this event. Please RSVP by April 6, 2011 by calling the Childrens/ Teen Servies Office at (313) 481-1361 or (313) 481-1409. Or call the Book Beat at (248) 968-1190 if you have any further questions regarding this event.